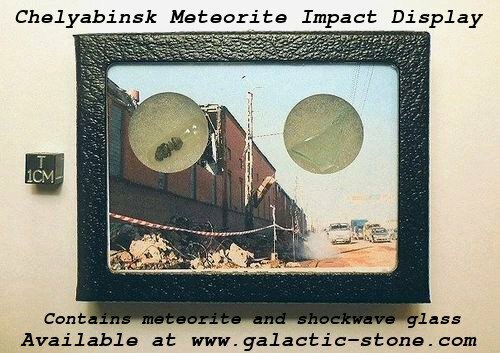 This display features small samples of the Chelyabinsk meteorite and window glass broken by the shockwave. The specimens are set against a color photo of a lead factory in Russia that was destroyed by the shockwave that followed the explosion of the incoming meteorite in the atmosphere. This display would be ideal for collecting, display, or educational use. On February 15, 2013, a spectacular bolide streaked across the sky of Russia and the town of Chelyabinsk. The bolide was so big and bright, that many people ran to their windows to look at it - a minute later a massive shockwave from the impact slammed the city, causing major damage. A factory wall collapsed and thousands of windows were broken by the pressure. Hundreds of people were injured by flying glass and debris. This was the most devastating meteorite impact in Russia since Tunguska nearly a century ago. Unlike Tunguska (which was likely an icy comet), the Chelyabinsk meteorite was made of dense stone, so many fragments and meteorites survived the impact and are scattered across a large strewnfield. The displays available here measure approx. 4 by 3 by 1inches (100mm x 75mm x 25mm). The samples inside can be removed and handled if desired. Wow, made me look more into meteor induced shock waves! As could be expected, the overall number of meteoroids capable of shock formation is only a fraction of the overall meteor influx to earth. But the shock waves are formed all the time. There is an extensive sciencedirect scientific article about measuring and observing the shock waves - also search for text "Chelyabinsk" to find out more about it!